I want to be respectful of women who describe their hospital births as completely satisfying. I don’t want to discount or criticize their experiences. The birth of a child is life changing and awesome. Medical management of birth is filled with a lot of directives. This involves obedience (sometimes “blind” obedience) to authority and protocol. Uncritical conformity to group norms means the individual often gets lost in the shuffle or hustle-bustle of the labor and delivery room procedures. I will go out on a limb and say that we have passive tolerance of the medical model when we agree to entering the institution. Although it is often subtle, we set ourselves up for de-individuation or being a “slab of meat” on the obstetrics assembly-line. We are not special; we are a pawn in the system. Many medical personnel do their best to treat us special, but on many occasions, you don’t feel special. There is a diffusion of personal responsibility. We do not take full control and responsibility in the hospital, but we do when we are at home, alone. 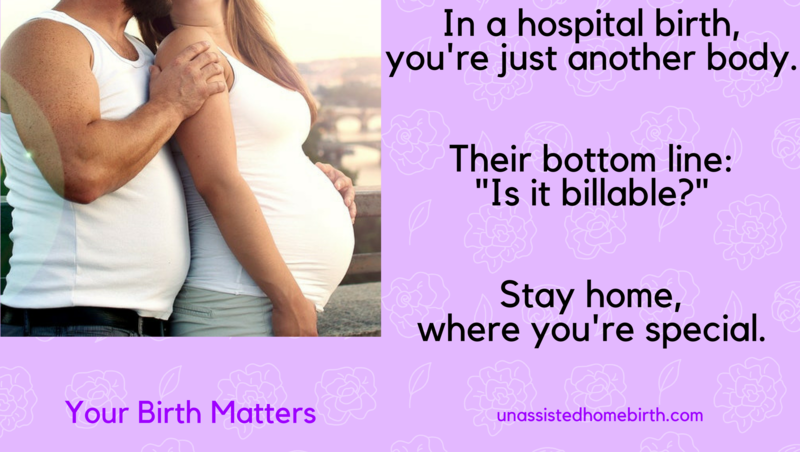 In my experience and the experience of thousands of other couples who have had both hospital and unassisted births, unassisted homebirth brings much more satisfaction than a hospital birth.